Questionnaire: What's Your Barbecue Style? Home > Questionniares > Questionnaire: What's Your Barbecue Style? 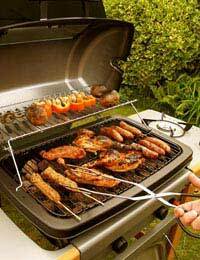 Barbecuing has become one of the most popular ways to cook meat in the past twenty years. The development of gas grills and the craze for turning gardens into ‘outdoor rooms’ have both contributed to this popularity, as has our desire to eat more as a family but not sat around the dining room table as our parents and grandparents did. Barbecuing skills range from novice to maestro, so our quiz helps you work out where you fall on the scale, and how you can improve your barbecue style. A. What percentage of women say they barbecue regularly? B. Cooking foods, especially meats, over a pit filled with hot coals is traditional in most cultures around the world. But where does the word ‘barbecue’ originate? 3 – from the Spanish barbecoa – or smoking meat over a low fire. C. What’s the best way to clean the barbecue after cooking? 3 – pour some oil over the grill when it is cool but not cold and rub with kitchen paper. D. Barbecue sauce makes any food taste better, but when should you add it to your cooking? 3 – When the food is cooked, as a condiment. 3 – what you give the chef’s shoulders when he’s been flipping burgers all night. Mostly 1 – gourmet griller. You know your grill inside out! In a 2006 survey, 50% of men said they grilled frequently, compared to 33% of women – and half those men also rated themselves as expert barbecuers compared to just one in five of the women, so you’re part of a smallish band. You know your rub (dry ingredients applied just before cooking) from your marinade (wet ingredients applied several hours before cooking) and you probably even knew that every one of those origins of the word barbecue is true – nobody knows where the term originated! Mostly 2 – good griller. You’re a pretty good grill star – you’re smart enough to use the barbecue to make your life easy: by turning up the heat and using a metal scourer to clean the grills, for example, but you could be a little more adventurous in when and how you barbecue. Mostly 3 – basic barbecuer. There’s a world of adventure out there for you, if you’re willing to explore it and knowing some barbecue tips and hints – such as that you only need to add barbecue sauce for the last twenty minutes of cooking - could give you all the confidence you need to get grilling. Questionnaire: What Kind of Meat Eater Are You?